Blackhawk #430500BKR Serpa Lvl2 Black Tactical RH - Fits Glock 17/19/22/23 -NEW! 1 product rating - Blackhawk #430500BKR Serpa Lvl2 Black Tactical RH - Fits Glock 17/19/22/23 -NEW! Trending at $102.59Trending price is based on prices over last 90 days. 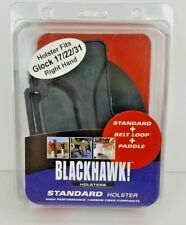 Blackhawk Tactical Y Harness Holster w/ Glock 19, Glock20/21, S&W 45! Trending at $28.35Trending price is based on prices over last 90 days. Brand New & Original! Duty Gear Ready When You Are! Trending at $37.70Trending price is based on prices over last 90 days. This page was last updated: 19-Apr 16:10. Number of bids and bid amounts may be slightly out of date. See each listing for international shipping options and costs.